Dream Your Ride : Adventure or Dual Sport? I grew up riding dirt bikes and my first street legal motorcycle was a 1978 Yamaha DT 175 Enduro. I spent more time riding off road with this motorcycle and the nice part was I didn't need to load it in the back of the truck to get it to the dirt. While the enduro wasn't as capable as my MX was, it was easier to get to the dirt and I rode it much more as a result. Thus the charm of the enduro, which was "re-titled" as a Dual Sport sometime later. One of my current motorcycles, a 2008 Kawasaki KLR 650, that's been upgraded significantly for travel, is splitting the difference between what many consider a Dual-Sport and an Adventure motorcycle. It splits the difference in weight and power, with the big advantage being a lower cost then the Adventure motorcycles and more comfortable for long rides then a Dual-Sport. As much as I like my KLR, I love the big Adventure motorcycles and one will be in the garage sooner then later. The decision will come down to one of the 1000+ cc bikes vs. one of the 800cc bikes. The larger bikes have power, comfort and sportbike like handling, while the "smaller" 800cc machines are lighter, more manageable off road and are have more then enough power to move down the highway at above legal speeds. 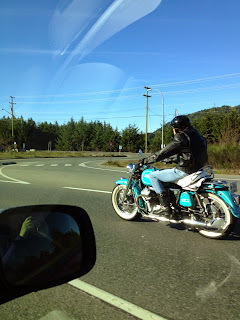 I view the larger Adventure style motorcycles as the best "do it all" motorcycle style on the market. The Triumph Explorer XC - A big, fast and comfortable motorcycle that manages off-road better then it's size and weight would indicate. For a great perspective on Adventure vs. Dual Sport motorcycles, check out the Bike Bandit Blog at The Blurring Line Between Dual-Sport and Adv.